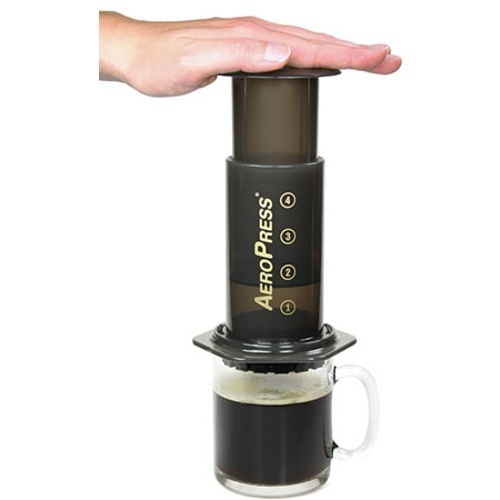 Use the Aeropress to brew a hearty cup of coffee in a fraction of the time your drip brewer takes. 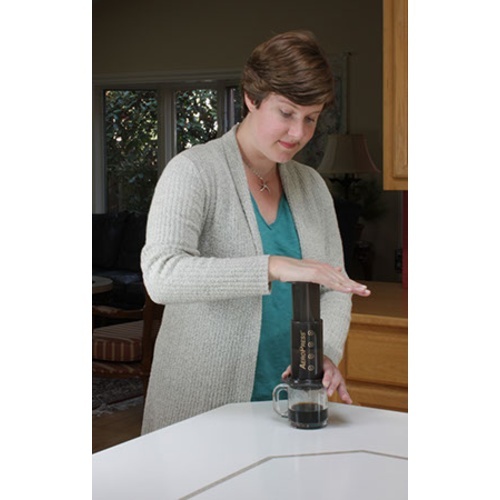 This new and innovative way to brew coffee, the AeroPress produces a very strong, espresso-style coffee that can be drank straight up, or add more water to tone it down. The result is a unique cup of coffee with very low bitterness. 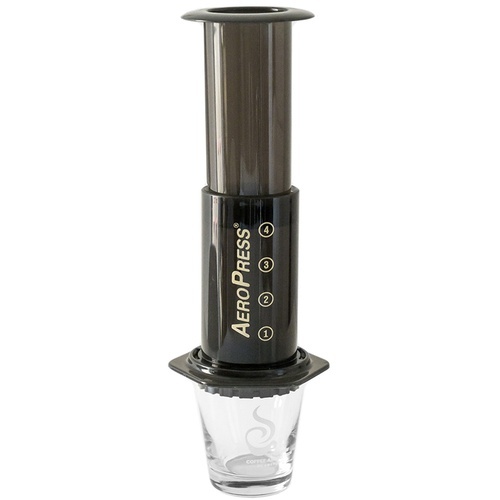 The AeroPress makes use of pressure applied to the top unit to push 175F degree water through the coffee grounds and only requires around 10 seconds of steeping (unlike a french press which requires 4 minutes). The entire process start to finish takes only 30 seconds! 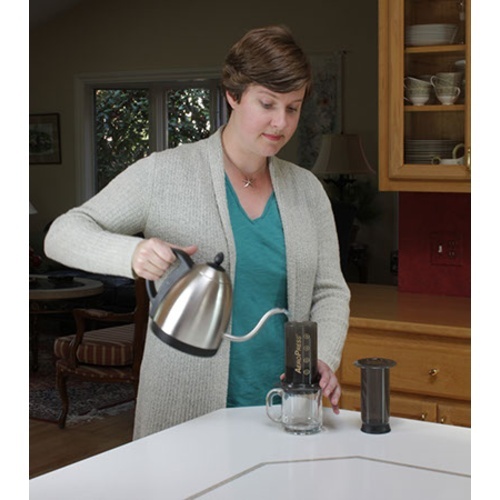 In our own tests, we found that the AeroPress does indeed make a tasty cup of coffee. The unique markings on the side of the plunger assembly make filling the AeroPress to the desired strength a breeze. 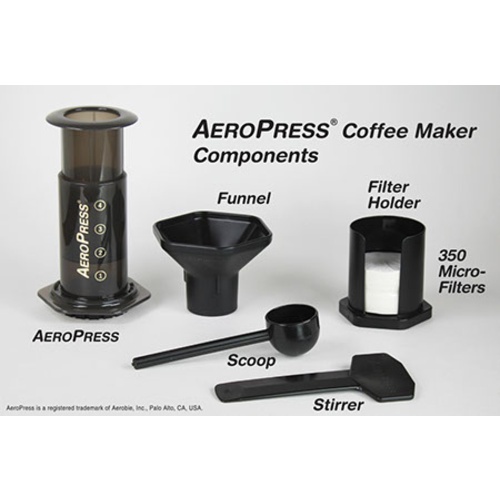 And the included stirrer, funnel and coffee scooper make measuring and brewing even easier. Check out the MoreCoffee! AeroPress Tutorial! * Water and grounds are mixed together for ten seconds. * Then gentle air pressure pushes the mix through a micro-filter in 20 seconds. * The total brewing time of only 30 seconds results in exceptionally smooth flavor. * Tasters ranging from professional cuppers and author Kenneth Davids, to coffee aficionados all praise the smooth, rich flavor. Ive got a drip coffee maker, espresso machine, and a french press. They are all gathering dust in the cupboard since I got an aeropress. It makes the best cup of coffee Ive ever had. Easy to make, easy to use, easy to clean. A pocket of air forces the water through the grounds and into your cup. Almost like an espresso shot, in a way. I add water to my finished coffee because it is so strong. And a lifetime guarantee, how can you go wrong? Hands down the best coffee maker Ive ever had. I have one at home and I love it. I like to brew the coffee over ice it makes a very good cup of coffee.